A spelling app for your words. Whether you are a student, teacher or parent, we all know the weekly spelling drill. Monday, we get our weekly words. Wednesday, we have our pre-quiz and Friday is the spelling test. Of course, during the week there are endless impromptu spelling quizzes, – at home, in the car, at dinner, before bed – you get the idea. Well, all that just changed – say hello to SpellBoard! 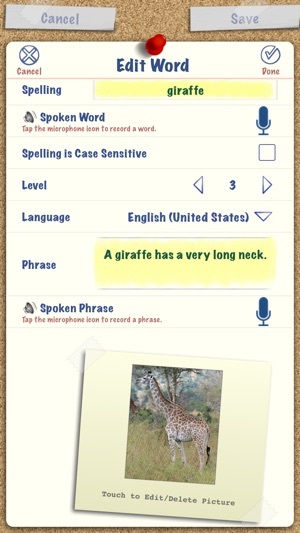 SpellBoard allows you to create any spelling quiz in any language. That's right, you could even use this for your Spanish class! 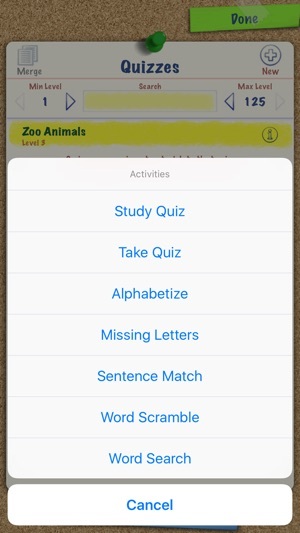 SpellBoard adds fun activities to your custom spelling lists. Including Word Search, Word Scramble, Alphabetize, Word/Sentence Matching, and Missing Letter puzzles. 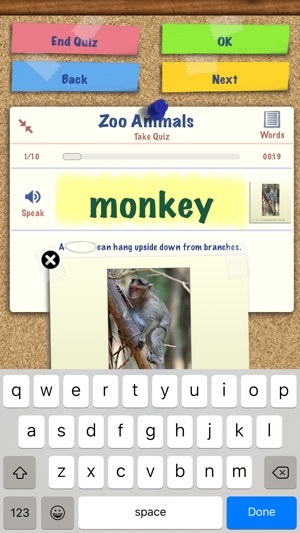 SpellBoard provides a fast and intuitive way for you to enter your list of spelling words. All you need to do is enter the word (correctly spelled) and the grade level. SpellBoard will take it from there using iOS's built in speech technology* to quiz you on the words (if desired/needed you can record audio in your own voice as well). Optionally, you can enter a phrase for the word, an image, antonyms and/or synonyms and notes for the word. That's it! Now you are ready to study your words and be quizzed on them. 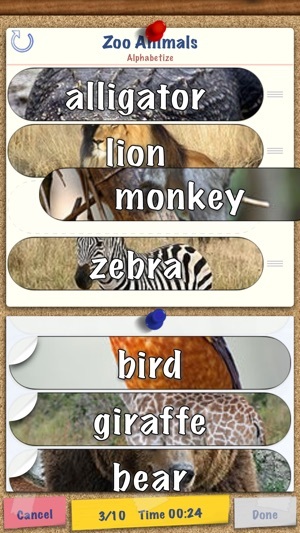 SpellBoard also adds fun activities to your custom spelling lists. Including Word Search, Word Scramble, Alphabetization, Word/Sentence Matching as well as Missing Letter puzzles. And possibly best of all, you can share your quizzes with other SpellBoard users, that means only one person needs to enter the weeks spelling words and then share it with other SpellBoard, SpellBoard Buddy, or even SpellBoard Mac users. Additionally, SpellBoard allows for multiple student profiles so you can track the performance of any student across any number of quizzes. You can also track how well multiple students perform against a particular quiz. 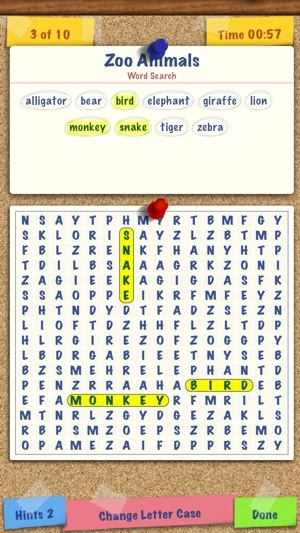 SpellBoard also has a study mode where you can walk through a quiz seeing and hearing the word and phrase. You can practice writing the word on the virtual white board or connect to Wordnik to get a definition for the word. Give yourself the added advantage, add SpellBoard to your learning toolbox. • SpellBoard supports iCloud Syncing, the Apple Pencil and iOS Split View. 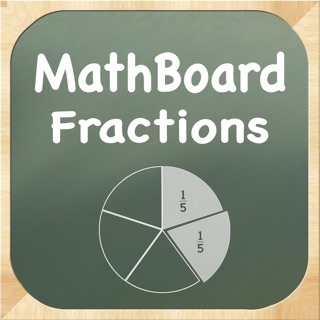 I am hoping to model the use of this app in classrooms and encourage a few more teaching staff to utilise this kind of technology in supporting their students. Particularly for those independent rotations which are always tricky to provide explicit targeted instruction without the instructing adult present. However, I have a suggestion to improve this apps scaffolding to support student’s spelling. It would be incredible if this app could have an option to not only say the letter names but also say the letter SOUNDS. So that student get exposure and explicit instruction to the essential phonemic awareness skill segmentation of sounds to support their spelling development. 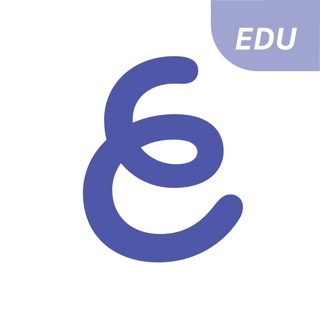 SpellBoard is an app that helps me to learn spelling, SpellBoard is a great app for school, learning and of course FUN! 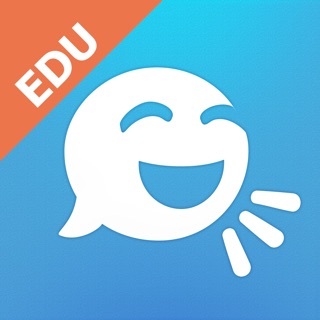 The app also helps my Vocabulary and get to learn more every day (In a FUN way). It also helps me to learn new definitions. Over all I give SpellBoard five stars out of five stars, and I thank you SpellBoard for teaching me new words, vocabulary and definitions. I would like more choice of colored pens please! Copyright © 2010-19 palasoftware Inc. All rights reserved.